Plot here isn’t really going to be elaborate. I know for a lot of the monster flicks out there, it usually isn’t, and in so knowing I didn’t expect a whole lot of plot out of this thing, but for those wondering it’s simple as can be. Dude finds a nice forest spot to propose to his girlfriend, monster in the woods gets his girlfriend, and then man wants answers as to what happened. Of course, the cover tells us the audience what those answers are: bigfoot. The thing really doesn’t play much more than that, unless you count the sequel-bait ending that had me question if this was supposed to be part of the “dark cinematic universe” or whatever the heck Universal was calling it these days. It’s serviceable for what it needs to be, but I wouldn’t go as far out of my way as to say that it really sets it apart from anything in any sort of way when it comes to story - and a lot may find that they’ve seen better elsewhere, even amongst monster movies. Maybe not amongst bigfoot movies. I haven’t seen all of them, but I’ve seen enough sas-stinkers to know that the bar for a decent ‘foot movie is pretty darn low. Still, thankfully for a lot of flicks out there, there are more things to a movie than it’s story. The actors do a pretty decent job here with their parts. It’s a bit budget feeling at times, in particular with the main, who we spend the vast majority of the movie with in the first place. As usual, considering sometimes he does a good job, I don’t know if the actor is entirely to blame or the direction he was given. The chemistry between him and the old lady-sandwich is well enough, and I find people would be more likely to believe it than they did most the interactions in Valerian. It still has some pretty lame moments, but it’s enough to achieve it’s purpose in the movie. The only other real sidekick character does a decent job hamming it up in his role, and at times he’s got some great interactions with the main despite neither of them really having any particular reason to be so connected and protective of each other considering they never met before then. Usually this is where i’d say the lines are totally understandable and well balanced, but I have to admit - despite being understandable and balanced, they also at times sound like crap. I mean, we aren’t talking “B-52 bomber” back in the day audio, but there’s a distinct audio quality of plenty of scenes sounding like they used a camera’s on-board microphone to pick up the lines while out in the woods and then boosted it so that the watcher could hear it fine, complete with that little level of static that you’d expect. Other times this isn’t an issue, but overall it leads itself to feel a bit erratic because of it, especially with many a modern movie - even the budget ones - having such well done audio quality. The folly and other sounds, including the music, don’t seem to usually have this effect either, coming in quite fine sounding. There are a few moments where the music helps to really sell the scene and add some tension or gung-ho to the happenings, but largely there’s nothing in there that’s going to be following me around after the movie. Every notice the amount of horror movies that start off looking great? The other effects are pretty good. Although it’s not really an effect per most lines of thought, the setting really helps add something to this movie. The woods are incredibly beautiful in plenty of scenes, including the waterfall ones, and at time straight up look like a different planet with all the plants and moss-ridden trees on display. Probably less so for someone whose an avid hiker and used to plenty of vegetation, but for this indoor-preferred dude, it’s a nice sight. It also helps sell the isolation portions of things, as largely you never see any sort of building remotely around the place, even out to where the car is parked in the first place. We also get to experience three different elements - fine, rain, and snow! Blood is pretty wet and watery here, and we have some mean looking wounds a couple of times across the screen - although you would see far worse in terms of levels of graphics from a zombie movie, we do get a broken bone popping out at one point that looks pretty painful. The Bigfoot portion of things is interesting to me. The suit itself doesn’t look bad, although considering it’s still essentially a big hairy beast with fangs and claws makes it somewhat hard to really mess up, despite it having happened before. They also do the common wise monster movie thing of not over-showing the monster in most cases. There’s a flash of ‘foot running across the screen, or some quick motion behind a tree, or an out-of-focus beast standing over the characters shoulder. Towards the end and the climax, it starts fromping about more front and center, and even then it still looks perfectly fine albeit not really super impressive - but I’d argue that’s more of a side effect of there isn’t much you can do to make Bigfoot look impressive on screen. Where I get more interested in this, however, is the finer details - things like tree knocking, throwing trees and rocks, and even stacking rocks. These are all things attributed to one Bigfoot or another at some point, and it’s nice to see these little details worked into the movie over just another “could really have been anything out in the woods but we had a Bigfoot costume.” Again, those details wouldn’t impact the brunt of watchers, but to someone whose already into cryptids and monsters and the likes, I love seeing that sort of thing. The thing overall does bring up some questions for me at times across it’s runtime however. At first, it feels pretty slow - when something outside the norm finally happens, we just cut away and go back to slow dealing with things a year later. It’s an abrupt shift of events that can leave you wondering what happened there, and the fact that after the jump our main is in a mental institute only sort of enhances the question of what happened immediately after. Beyond that, at times there are moments where a person, usually the main, will make a choice that really doesn’t make much sense to you as a viewer - like set up this huge elaborate plan (or at least it seems that way), only to completely not use it in the slightest manner when the situation arises and go off the chain in a manner that somewhat ends up using it. As a person not stuck in the woods with a killer Sasquatch, I guess I can’t speak for certain of how off these actions seem, but as far as the watching goes if you are the kind of person who yells at characters to “don’t go up there!” than you may find yourself questioning what some of these people are doing. Sasquatch isn’t good on the insurance. Overall, the saving grace of this movie is that it didn’t overstay it’s welcome. Had it been another half hour long, I may have started questioning if I was enjoying myself. I never felt like I wanted to shut it off and do something else while watching, but some of the stuff on screen - particularly the beginning - felt incredibly routine to me and only the promise of what might happen later really kept me onboard during those moments. 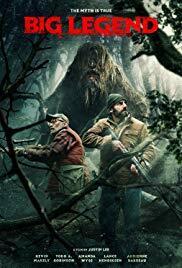 I can appreciate many of the little factoids they included about the Bigfoot in the movie, but they also largely don’t impact the movie at all in a meaningful way. The effects are good, but the audio has a hard time sounding like a full amount of effort was put behind it it. In the end, although the movie isn’t really great, it’s also not really bad - which much like a lot of movies in a time where over seven hundred movies come out a year, makes it relatively mediocre. In my book, being mediocre isn’t as bad as it is for a warboy, but some people also value their time more than me. Still, you probably know if you want to watch this thing or not as soon as you see Sasquatch on the cover, and I’m not going to tell you you shouldn’t - because oh man have I seen far worse Bigfoot films than this.